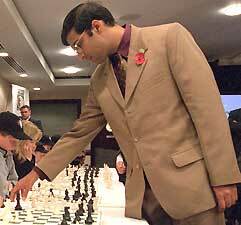 Former World chess champion Vishwanathan Anand is on the comeback trail. After a bad year which saw him drop to world No. 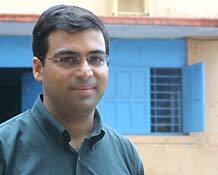 2, the Indian Super Grandmaster has expressed his intentions to go after the magical 2800 Elo rating. The 32-year-old, who was in Mumbai to promote NIIT's chess academy, feels the different factions in the world of chess have harmed the sport in a big way. With Ashish Magotra, he discusses the future of the sport and his own plans. Do you think chess is a reflex sport? What kind of a player are you? Decisions in chess can be logically or they can be made intuitively, and it has more to do with players. People arrive at decisions in various ways, depending on their personality and so on. So it is not really the sport that depends on reflexes; it is the players. I am a pretty intuitive. I try and approach the problem logically and then half-way through it I'll get bored and play intuitively. Chess, like most other sports in the world, seems to be suffering because of the lack of good rivalry. Like, for example, that between Garry Kasparov and Anatoly Karpov, in the early eighties. Depends on how you look at it. The politics in the sport is certainly not very healthy, but the game still seems to be growing, not to say that a better job could not have been done. Definitely, technology has benefited the sport immensely. The computer and the Internet has been a boon to chess. A lot of people who had given up on chess for a while have come back because the Internet makes it so easy to find a partner. So, in that sense, the sport is growing very well. It is growing in India and China, and that adds up. But, of course, the federations could do a better job. So are computers ruling the roost? At the moment it is pretty competitive. As far as I can tell, there has not been a quantum leap in computer technology in the last 2-3 years. Earlier, it was almost like Moore's Law, where the computer got stronger with every generation of processor. But now the growth is much slower. It's not fifty points but now it's 5-10 points. The Man versus Machine contests these days are pretty even. Who knows what the future will bring, but at the moment it's 50-50. Rapid chess versus Classical chess. Do you think the former is proving to be detrimental to the latter? I think they compliment each other. Very often in tournaments where a classical game fails to produce a result the tie-breaker is most often a rapid chess game. I don't think these things hurt each other. The Indian scenario has looked very promising in the last few years. Pendyala Harikrisha, Abhijit Kunte, Koneru Humpy and Swati Ghate are all talented. But do they have it in them to make it at the world stage? They have the talent, but how they get there is the big question. On the men's side you have Kunte; on the women's you have Swati, who are both very talented. I think the nice thing in Indian chess is that it is well represented by both genders. It's a bit of everything: playing international tournaments as well as working on your game; that will being results. It basically depends on the personality. With me, for example, I like playing. I find it difficult to work for 3-4 months whereas others can like it. They are all experienced enough to find the right path. You are looking to get your Elo rating above 2800. How exactly do you plan to�make that happen? I need to do well in the classical tournaments and get the score up steadily. I fell all the way from 2797 to 2752 points. And that was a really bad period in my career. Probably the worst! But the good news: I have steadily advanced from there to 2762, where I am right now. But in July I will be 2775. In the meanwhile, the No. 2 guy has fallen to 2789. So we are looking at a 14 point gap and, hopefully, I can bridge that gap. I think to try and get to 2800 in one tournament is unrealistic. So, right now, I am trying to concentrate on getting as many points that come my way. People always talk about Garry Kasparov as being the strongest chess player ever. Do you think his standing as the best in the world holds true now as well? He is certainly one of the all-time greats. But it is very difficult to compare players over a long period of time. I mean, I like Bobby Fischer, but somebody else might like Kasparov. But, at the moment, his standing in the world of chess is not that clear. He is still probably number one, but he is also a little bit shaky these days. Earlier, you spoke about the factions in chess -- the Professional Chess Association and the FIDE [Federation Internationale de Eschess]. Do you think chess is still recovering from the divide? Yes. To be honest, the PCA folded up in 1996, but they just keep changing their initials and it goes on. Yes, it has hurt the game. When some of the best players in the world won't play in the World championship it hurts the sport, and that is clear. Clearly, the fact that everybody signed up for reunification means that they saw the light. It simply can't go on like this. But somehow the politics has taken over again. Hopefully, we can just wrap this up once and for all. It's a pain in the neck. So what's next on the agenda for you? My next tournament will be at the end of July, in Dortmund; a classical tournament. After that, it's three rapid chess tournaments -- Mainz, also known as the unofficial World Rapid championship, and then two big Rapid chess events in France, in October.